The type of power system a water ionizer uses can impact the energy efficiency of a water ionizer, how much heat is generated during ionization and performance consistency. In this segment we’ll go through the types of power systems used in water ionizers available on the market today and why the amount of power used is so important. Water is “ionized” when sufficient electrical current is delivered to the water to cause the H2O molecule to split – which forms positive and negative ions. The more electrical current delivered to the water, the greater the “splitting” power – or ionization potential. This is why most water ionizers using at least 150 watts of power for ionization. While electrical conductivity can be enhanced by using electrodes with some sort of texturing (mesh plates), the greater the available wattage during ionization, the greater the ionization potential. Given the varying mineral content of source water in the United States, water ionizers using a large number of textured (mesh) plates with high wattage therefore stand to offer the greatest ionization potential in most source water areas. In the early days of water ionizer technology, water ionizers used the conventional transformer power supplies. Now, most water ionizers use the newer SMPS power supply systems. Transformers use a single line of current to deliver power to the electrodes in the electrolysis chamber. While effective, it is generally considered less efficient. The power delivered through the single current varies with overages dispersed as heat. Electrical currents are inconsistent, wavering during use, so the device is not always getting the optimal power required based on user selection. SMPS power supply systems use two rapidly switching currents which maintain the optimal electrical output based on the devices’ settings. The rapidly switching currents significantly minimizing fluctuations in electrical current. Today, most technologically advanced water ionizers use SMPS power supply systems. Low heat, optimal electrical output and better energy efficiency help protect both the integrity of the electrodes and the heat-sensitive components of the computerized control system. SMPS power supply systems are also smaller and lighter which allows more room inside the water ionizer for other critical components – or reducing the size and weight of the unit altogether. When comparing water ionizers, take a look at the maximum available wattage of the unit and the type of power supply used. In many cases, water ionizers using SMPS power actually have longer available warranties – likely due to the decrease risk of premature wear and tear on components due to excess heat generation. This is especially true if you are looking at water ionizers using over 200 watts of power. The higher the wattage, the greater the likelihood of excess heat generation. Most water ionizers that offer higher wattage and more electrodes will typically use SMPS power supply systems. 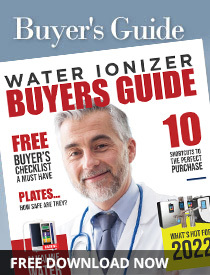 The amount of power used for ionization and the power supply system are key to a water ionizer’s performance. It is the strength of the electrical current delivered to the water that determines the number of H2O molecules that are split to produce the positive and negative ions – or ionization potential.